Marcy Heacker, a wildlife forensic scientist at the Smithsonian Institution's Feather Identification Lab in Washington, DC, spoke with Laurel Neme on her "The WildLife" radio show and podcast about wildlife forensics, bird strikes and feather identification, and how her analyses help airports manage wildlife to enhance airline safety. She also discussed how she and other forensic scientists at this lab helped analyze the crash of U.S. Airways Flight 1549, otherwise known as the "miracle on the Hudson." This interview originally aired August 9, 2010. The interview was transcribed by Ryan Lavery. Bird strikes, as we saw from the "miracle on the Hudson," have the potential to be extremely dangerous. While typically the result is not as catastrophic, birds and other wildlife strikes to aircraft annually cause over $600 million in damage to U.S. civil and military aviation each year. Yet in order to deal with those strikes and reduce the chances of future ones, airport authorities must know what species are being hit. That's where the Smithsonian Institution's Feather Identification Lab comes in. For instance, using the lab's identification of species that do the most damage to their aircraft, the U.S. Air Force Bird Wildlife Aircraft Strike Hazard (BASH) Team, gathered information about the habitats of commonly struck species, their breeding behavior, and migratory patterns. Then, they created a dynamic map of bird strike risk levels across the United States. That helps pilots avoid flying in certain areas at certain times of the year based on the concentrations of birds that are predicted to be there. The species identifications from the lab also help airport biologists manage the habitats in such a way so as to discourage wildlife from congregating in the area. While the methods will vary depending on each unique situation, it works. For example, JFK International Airport in New York has reduced the number of gull strikes by roughly 80 percent by using tactics such as grass management, eliminating standing water, and frightening birds with pyrotechnics. All that is possible once you know the species you are dealing with. Marcy Heacker is a research assistant with the Smithsonian Institution's feather identification lab in Washington, D.C. She received her Masters of Science and Bachelors of Science in Biology at George Mason University in Fairfax, VA. She also holds an Associate's Degree in Veterinary Technology from Columbus State College in Columbus, OH. 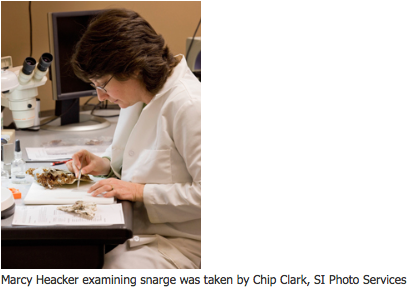 The main focus of Marcy's work is in avian species identification from microscopic and whole feather characters. This specialized work in wildlife forensics is particularly important for aviation industry personnel that deal with civil and military bird strikes. This feather identification service has lead to collaborations with scientists in the fields of aviation safety, wildlife biology, anthropology, and law enforcement. Marcy's current research is on the feather microstructure of the ducks, geese, and swans. Laurel Neme: How many cases do you get a year? Marcy Heacker: It has grown quite a bit... Back when I first started [10 years ago] I was probably doing 1,000 cases a year. I believe last year we did close to 5,000 cases. There are four of us in the lab now. The lab just keeps growing. Carla Dove is the director. Jim Whatton and I are both research assistants and we do a lot of whole feather I.D. and a lot under the microscope ... and now we have a genetic specialist, Faridah Dahlan. Laurel Neme: Are most of those cases bird strike cases? Marcy Heacker: They are. 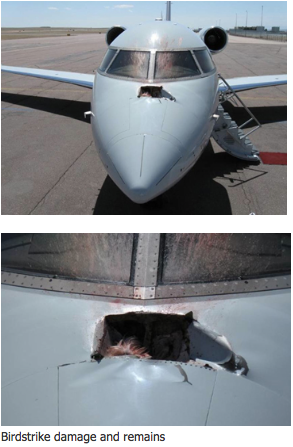 The vast majority of what we do is aviation bird strikes -- birds that hit aircraft. Laurel Neme: What are the different forms a strike can take? Marcy Heacker: It ranges. Most of them are not damaging. A lot of times, [the pilots] don't even know that they have hit [a bird] until they've landed and the maintenance personnel inspect the planes. Especially for the military, they definitely inspect the aircraft and the different mechanisms along the aircraft too. That's usually when they will find [evidence of strikes]. They will find a smudge or maybe a few feathers... The vast majority are what we consider non-damaging. [We provide data on the strikes for] information purposes, to help wildlife biologists [on airfields]. ... Their job is to manage the wildlife on and around the airfield. Our job is to help them get information of the species that are actually striking the planes or occurring on their airfield. 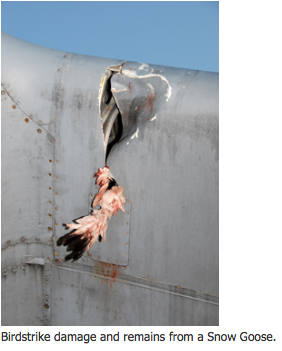 Laurel Neme: Why is it so important to know exactly which species are involved in the bird strike? Marcy Heacker: That's a really good question. …We can talk to some of the older pilots and they are like, "Oh, we just used to fly through them and go on." Then, after a couple of tragic instances, including [US Airways] flight 1549 in the Hudson, the safety issue [came to the forefront]. In the aviation world, [the feather identification lab] falls under the umbrella of flight safety. If you know what the problem is – which for us would be species – you know how to deal with the problem. You can document the problem and then go on to assess and mitigate and try to analyze and manage it, pretty much like a wildlife management issue. Our part is at the very beginning: you have to know what species are being struck to get a good analysis down the road for mitigation and management. Laurel Neme: Do different airports have different types of species that are problems? Marcy Heacker: They [do]... I always considered every airfield as different. Every airfield has its own issues. If you think about it, these airfields are just wonderful [habitat of] flat grasslands. [For the] species [that] tend to [be] struck , they are logically [the] species that [either] love to hang out on grasslands or hunt grassland species (like the raptors). Laurel Neme: What are some of the common species that are struck? Marcy Heacker: Some of the most common (and what we consider non damaging cases) are things like mourning doves, swallows ... and savannah sparrows. These are very much the species that just love these open grasslands. That's the most common. [You could also] look at it a little differently: the most damaging. [That] could be anything from a hole in the wing or a bird going into an engine. [When] they happen, [you have to] to tear the engine down... [That means] down time [for] the aircraft. If you are thinking of the civil aviation world, they have to turn over these aircrafts [quickly]... Downtime can be extremely costly. I believe one of the last [estimates] I heard for civil aviation bird strikes and wildlife strikes, is about $600 million a year is lost. So, the number one issue for bird strikes is safety because, hands down, we want to keep people safe. The secondary reason [to be concerned] is, to be honest, a money issue. It's to reduce the damage costs and down time. Definitely, it's an interesting aspect of wildlife management and human wildlife interaction. Marcy Heacker: Yeah, you don't. If a civil aircraft takes off and unfortunately hits a vulture on the way out, ... for safety's sake the pilot may make the decision to try to turn around and land. But he or she may have to dump fuel. So then they lose all that fuel, they've got a plane full of people, and they have to make arrangements for all those people. [That can be] quite costly. Laurel Neme: Do airports attract birds because they tend to be these open grasslands? Are they a magnet? Marcy Heacker: Yeah, they are... If you think about your backyard, if you want to attract animals to your backyard, you provide food, water, and shelter. For our work, for managing wildlife on airports, it's almost the opposite. We want to keep the birds off of the airfields. So, you have to look where is the food, water, and shelter and get rid of it. There's a lot of environmental mitigation that goes on [at airports]. That's where we come in, for species I.D. If we constantly provide species I.D. for a biologist on an airfield, over time, he or she can track trends. Then, if all the sudden (s)he notices that (s)he is getting a certain heron at the end of one of his runways, (s)he can go down there. If there's maybe a ditch filled with water or a wetland, then (s)he can do environmental mitigation and get rid of the wetlands, or maybe mow the grass shorter, or maybe keep the grass longer. It just depends on what their species problem is. That's where we come in. We help provide them with the species information. Laurel Neme: How does a case work? Can you walk me through one? When are you first notified? Marcy Heacker: We never know what we are going to get. That makes it kind of fun [from a professional standpoint]. We can receive probably an average of about twenty [items] a day. During migration [periods], we can get a hundred [items] a day. And every case is different. Then, for identification, it totally depends on what material we get. Laurel Neme: What kinds of material do you get? Marcy Heacker: We get the full gamut. It can be anything from a whole frozen carcass to a partial carcass, or maybe a piece of a wing or a piece of a body to just a bunch of feathers found stuck into the seams of an aircraft. Or sometimes if they have a whole bird, they'll just pluck some feathers to send to us. Over time, [aircraft personnel have] learned how to get better and better and better at collecting. And, with us doing DNA, now they're doing what we call paper towel swipes [on what] are just smudges on the airplane, maybe a blood smudge. Unfortunately, it's where a bird hits and skips off the airplane, where there is just kind of a mark left. We call that material "snarge" or "bird snarge." We get that quite a bit, too, especially for some of the expensive military planes where [personnel] really go over those aircraft with a fine tooth comb. Laurel Neme: After every flight, is someone examining the aircraft? Marcy Heacker: Most of the time for military flights. Not so much for civil, unless they or the pilot sees something obvious. Laurel Neme: Does some sort of report accompany the material? Marcy Heacker: It does. The Air Force has an online bird strike reporting system, and the civil aviation has a very good online bird strike reporting system now, also. It's great for compiling data. We can enter our identification directly online, and it goes straight back to the person in the field. FEATHER IDENTIFICATION: THE THREE "TOOLS"
Laurel Neme: When the material comes in, where does it go? Or does that depend on the type of material? Marcy Heacker: The way we approach an I.D. totally depends on the material we get When we get the material, the first thing we do is open it up [and] read the report. It's almost like a triage: "How are we going to work this case?" [When] we do identifications, we kind of have three tools in our toolbox. The first one is for whole feathers. [Whole feathers] have obvious color and pattern. There's enough material [with whole feathers] that we take [the feathers] out into the collections of the bird division [for comparison]. 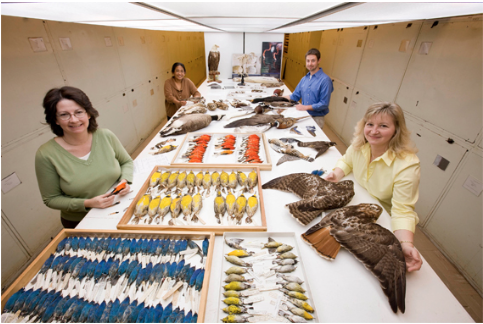 We have about the third largest bird collection in the world here [at the Smithsonian]. So, we have these vast aisles of specimens that we can actually directly take the feather and compare it to a specimen. So, we're not just doing this by memory, [although] a lot of it is memory and experience. Laurel Neme: So, you might know from the color, the size, or the shape of the whole feather which bird specimens to look at first? Marcy Heacker: Right. I actually have a case here I just opened right before you called and it has very good whole feather material... It's just like birding, where people go out and bird watch. I look at size. I look at color. I look at patterns. Does it have a spot or streaks? Then, just with our experience, we start to narrow it down. The report and information from the field is [also] very important for us. If you think about birds, they ebb and flow during the year. They can migrate. Some might be in one area in the summer, and not there during the winter. That's why we would need the time of year and location because of how birds ebb and flow during the year. So, you have to really know your birds. I also walk around with my bird guide in my hand every day. I try to remember most of it, but I use my bird guides quite a bit. Laurel Neme: Can you give an example where one type of feather is a certain size, color or shape at one time of the year, so that it would lead you to think it's one species, but at another time of the year lead you to think it's another? Marcy Heacker: Oh, sure. Some of the tanagers can change color from summer to winter – from bright red to kind of yellow green; or from age even if it's a first year male, it may look like a greenish yellow female, but then after a couple of years it will be a nice bright red. Another example would be these gulls that kind of get a little bit of brown speckling sometimes in the winter. Different ages and different sexes [produce differences, like] a female mallard versus a male mallard. We have to keep all those things in mind. So, with the whole feather being our first tool, that [involves] actually going out and comparing the feather— whole feathers or feather pieces— with the collections. 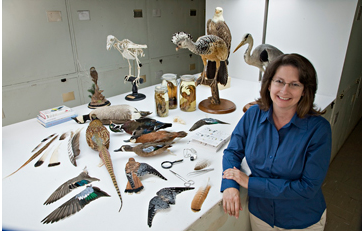 Laurel Neme: The bird collections act as reference collections. Marcy Heacker: Yes. .. We are comparing [the item] to a vouchered specimen... I can actually pull a specimen, similar date, similar time, similar location and physically compare it. In the museum world, a vouchered reference specimen is very, very, very important. You are only as good as your reference collection. That carries over into other forensic labs, too. No matter what they are working on, they all have extensive reference collections of known samples. Laurel Neme: While we are on the subject of the whole feathers, can you tell me about the feathers themselves. What are the main parts of a feather? Marcy Heacker: That's a good question because it's important for us, and will lead into our second tool, which is the microscope. When you look at a feather, the part that you see on the bird— it's usually the top part— we call it the distal part. It's the part that's going to have the color and pattern. The microstructure of that region for all birds is basically the same. It looks like little hooklets. That's how the feathers hold themselves together, the hooklet on one little barb reaches over and grabs onto the other side. It's really interesting but, for our casework, unfortunately, that distal part with hooklets doesn't help us for identification. They all look the same. Laurel Neme: So, what do you use? Marcy Heacker: What we like [to use] is the little fluffy, downy part at the base of the feather. We call it the proximal part. That's the part that we look at under the microscope for different characters [traits unique to a group or family of birds]. Underneath the microscope, that little fluffy downy part actually contains different characters on it for different groups. Now, it is a little limited. You can't get the species. You can get the groups. So, I wouldn't be able to tell you, just [based] on microstructure, that [an item came from] a mallard. But, I could tell you it was [from] a dabbling duck. Laurel Neme: So you might know it came from an eagle, but not what kind of eagle? Marcy Heacker: We could get it to eagle. But [to go further], this is where the location and the date and the circumstantial evidence can help us. One example, that we see a lot in bird strikes, are chimney swifts. If you think about their habits, you know they're out feeding around the airfields. [Feathers of chimney swifts] have fairly unique microstructure. On the east coast of the United States, we'll go ahead and call [something] a chimney swift, even though under the microscope it looks like a swift. But [from] the location we know it's going to be a chimney swift. There's no other swift, say, in Virginia, where I am. [However,] on the West Coast we'd hold that I.D. back and call it a swift, because there're more [types of] swifts out west, in Washington state, for example. I wouldn't be able to tell if it was a rose or a white-throated chimney [swift based on microstructure]. So, there are some limits to microstructure. But it's still very valuable information for the biologists on the airfield. If we tell them it's a duck, it helps for them to know that. Maybe [it's] a migrating duck. Or maybe a duck [living in those beautiful ponds [they like to put] out in landscaping at airports. Is it a duck from the landscaping pond versus a pigeon roosting up in some hangars? Laurel Neme: How does the microstructure change for different species? What does it look like? Marcy Heacker: Oh, they're so beautiful. Sometimes they look like modern art. A lot of people say they remind them of plant material. Think about a whole feather. A whole feather is made up of feather barbs. It's a group of barbs that are run along the central shaft. If you go one more step, if you pull one barb off and look at it, it almost looks like a Christmas tree. The little shoots coming off of the barb are called barbules. That's what we look at, that third level down. If we get that under just basic light microscopy, the kind we all learned it in high school and college, we'd look from about 100 magnification to 400. We look at the barbules, and on that barbule level there's different pigment. There may be little dots. They look like little beads that run along these barbules. They have these structures we call nodes that can have different shapes. Some of them, like ducks, look like big pyramids. Pigeons have a crocus-like shape. Some of the nodes are really big only out at the very tip and the rest of the barbule's smooth. There's a vast variation. That's where the experience comes in, learning the combination of characters. Laurel Neme: So if someone finds a feather in their yard, they could examine it under a microscope at home or in a science class? Marcy Heacker: You could. It's basic microscopy. You make a slide and just look at it at 100x, maybe 200x. Just keep in mind a feather is made up of barbs. And barbs are made up of barbules. And you are going down to that third level of barbules. Laurel Neme: Do you compare it again to a reference specimen? Marcy Heacker: We do... We probably have the largest collection of feather slides in the world, a little over 2,000 slides. And, we have this great microscope where you can look at two things at a time, side by side. So we can put an unknown on one side and put a known reference slide on the other and ... match things up. Laurel Neme: How does the microstructure vary within the bird? Do you know if it is from the body versus the wing? Marcy Heacker: It can vary depending the part of the bird. Our microscopic standards are from breast feathers. Marcy Heacker: They generally have very good characters. I tend to call them robust. When you go out onto a wing or down on a leg, the microstructure starts to almost kind of fade out into nothing, just little prongs. Even if you start at the bottom of a whole feather, like the fluffy feather, you can get beautiful microstructure, beautiful nodes and pigment. If you start working your way up the feather they slowly transition into those hooklets. Remember the hooklets out at the distal part? It looks a lot like Velcro. It goes from beautiful nodes of the down, and as you work your way up the feather, it transitions to those hooklets, and up in that region there is no variation. The purpose of those hooklets is so strong for flight and protection that all birds basically look the same in that region. Laurel Neme: But, if you had the whole feather, from a wing or tail, it might vary more in terms of color? Marcy Heacker: It does. Yeah. So I probably wouldn't need to go [to microstructure]. Laurel Neme: So the microstructure varies based on where the feather comes from on the bird, and where you look at on the feather? Marcy Heacker: Yes, where on the bird and where on the feather. Laurel Neme: What about within the same species. Does the microstructure vary for adults versus juveniles, or males and females? Marcy Heacker: Juveniles and like fledglings and first plumage birds, their microstructure is not quite as developed. We haven't done too much work with it. But, if you go within a species, they all look the same. So, a female mallard looks exactly like a male mallard. Like I said, it would look similar to another dabbling duck. That's how the microstructure limits us to group. It's a little limited but still very useful. Laurel Neme: How do you get to species? You had said there were three tools in your toolbox. What's the third tool? Marcy Heacker: Our third tool is DNA analysis. We have been up and running [with DNA analysis] now for 3 years. It's opened up a whole new world and really improved the level of our I.D.s, particularly with snarge. Laurel Neme: Can DNA always be recovered? And is it contained in the feathers themselves? Marcy Heacker: If you think of the material we get, this is the challenge. We don't know what we are going to get. This material from these poor unfortunate birds that have struck planes, and we are talking about carcass material; it's not fresh. A lot of times, the good microstructures are at the base of usually the body. Well, what if we don't have any body feathers? That's the same for DNA. Once the organism dies, the DNA starts to degrade and break down. There are a lot of times when we cannot get any viable DNA out of the samples. It can be due to a number of reasons, such as normal degradation if the carcass is sitting around for a long time. [At the lab,] we use a "one pass" try at DNA. There are lab methods where we could sit down and really work at it. But, if it's just a typical routine case, we just kind of do a "one pass" DNA analysis. It's quite possible that there's no bird material in the sample to begin with. If might have been an insect or some other smudge that they have collected. So, there are a number of reasons for possibly not getting an answer with DNA. Then we would back off and do the feather microstructure, to get [some] answers. Right now, I would say we do about 5,000 cases a year and about 90 percent of our I.D. 's are to species level. That's through a combination of all three methods... One of my favorite things is how we end up working doing more than one method. Those three tools, it's a great quality control. If I want to confirm one of my whole feather I.D. 's, I can sample it and send it for DNA analysis. And, likewise, we'll pull some random DNA cases and check the microstructure for quality control that way too. Laurel Neme: DNA can be recovered from a feather, is that right? Marcy Heacker: It can. A lot of times, we're looking for tissue for sampling. If we get a sample on an alcohol wipe, if it's available, we'll go for tissue or blood. But in a lot of cases we do just have feathers. Hopefully, if someone plucks the feather, we'll go for where the feather inserts in the skin. We are going for the little tissue tag at the end of that. It's a lot like hair. You can't really get DNA from the hair, but if you go down to the root, where the root inserted into the skin, you can get DNA from there. Laurel Neme: I know your lab has developed a bird DNA library that has mapped the DNA genetic code of 96 percent of U.S. and Canadian bird species. Is that higher now? Marcy Heacker: It's still about 96 percent. I have to give credit. I keep coming back to the point that you are only as good as your reference collection. We have whole birds here in the bird division. We have our microscope slide collection. And, what we decided to use for our DNA reference is a group from the University of Guelph, and it's called the Barcode of Life Database, BOLD. They have a really good website. I encourage people to look at it. It's worldwide. The goal of this is we look at one piece of one specific gene. It is for identification purposes. It's not really used for taxonomic studies or phylogenetic studies. We're finding it's working really well for these straightforward identification cases. We do the DNA extraction here and the [polymerase chain reaction or] PCR, which is where you make a whole bunch of copies of the DNA. Remember, we are looking for very specific genes. The sequencing is done through the Smithsonian genetic labs. The sequencing is when you get that big long list of the ACTG's, the nucleotide sequence. Faridah [Dahlan] does all of this online. She'll get the sequence with the case number, and she actually copies that sequence into the BOLD search database. That's how we will get our matching species. Laurel Neme: Again, you're comparing it to a reference database? Marcy Heacker: Yeah. We feel very strongly about having vouchered references. There's always discussion of possibly sampling a bird when you band it and then you let the bird go. It's good, but we're trying to strive for at least a certain number of documented vouchered specimens for that reference database. So far, for our purposes of identification, the Barcode of Life is working really well for us. Laurel Neme: I'd be remiss not to ask you about the case of the US Airways Flight 1549, the miracle on the Hudson, and your lab work on that case. Can you take us through that case? What did your lab determine? What happened with the findings? Marcy Heacker: We initially heard about the case right away, through our colleague. We knew it was going to come in; it was just a matter of time. For that case, I believe our initial contact was through the USDA [US Department of Agriculture]]. The USDA Wildlife Service does a lot of airport wildlife mitigation. They said they were heading out there to sample, and we told them that we were ready, whatever we could do for them. That quickly changed to the NTSB, the National Transportation Safety Board. That's the organization in charge of the investigation. Laurel Neme: Did they know right away it was a bird strike? Marcy Heacker: Oh yes, they did. They actually were pretty sure it was geese because the pilot and co-pilot saw it and heard it and believed it was geese at the time. Once they landed, it took a while to get the aircraft back up out of the river. One of the engines was at the bottom of the river. So, it took us some time. We began taking samples there in New York once they got the engines up. Laurel Neme: Was the material really degraded because it had been in the water? Marcy Heacker: It was really amazing. There was quite a bit of material inside those engines. And, because it was the Hudson River, it had a good aroma to it. So we started having to think about jet engines. They are a series of fan blades – one behind another, behind another, behind another – and they get smaller and smaller and smaller as you go to the back of the engine. That's the way they tear apart those engines. They start at the front and just start pulling off each stage. What they did is they collected material as they were breaking down the engine from the front to the back. I believe we probably got four shipments, at least, of samples as they were just continually tearing apart these engines. They immediately collected some there in New York and got those to us. Then the engines went to Cincinnati to GE, General Electric, the engine manufacturer. We work with engine manufacturers quite a bit. That's where they tore down the engines and did even more collecting of material. My understanding is that, at the very back of both of those engines, there was quite a bit of bird material back there. This was a huge event... In a normal case for us, for a non-damaging event, we'll get one sample. If it's a whole feather case, we can probably work it in an hour, maybe two hours, and that includes the paperwork. That's for one sample. If we do DNA [for a normal case], we do one extraction. The Hudson River case was one of the largest cases we've ever worked on. We received 69 different samples. They were everything from a wipe on a cotton swab to pieces of burnt feather and dirt and oil to whole feathers that we could take out to the collections. At one point they sent us a piece of something from the wing or an engine part or something. It was quite a variety of material. 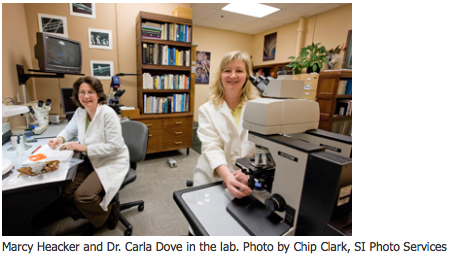 Laurel Neme: What, specifically, was the job or role of your lab? Marcy Heacker: NTSB already had an idea from the pilots that [the bird strike] was geese... But it happens so fast. They might get it right but a lot of times they don't get the species right because it just happen so fast. So, our number one job was to confirm the species. They thought that it was a Canada goose, [but] there's a very similar bird up there called the Brant goose or a lot of time cormorants in flight can look similar to geese. So that was our number one job: to confirm it was Canada goose. Our second job, and we do this a lot for the more severe cases and accident investigations, was to help the investigators recreate the accident in the specific impact points. After the crash, when they start rebuilding and recreating the accident, can we confirm that the bird hit here? Did it hit here? Did it go in the engine? We [also} try our best to [identify the] number of individuals [involved]. That's a little difficult for us since [sometimes that requires] very detailed DNA techniques. The final question was to see if we could tell if those were migrant geese or resident geese, which for the Canada goose issue is different too. Laurel Neme: How did you resolve those three different questions? Marcy Heacker: We had three different jobs that we had to do. The first one is our specialty. We just literally dove into that. All four of us worked together. It was a really exciting case. Out of the 69 samples, twenty had whole feather material that we could really look at. Five of those we could confirm were Canada goose. The other 15 we could only say it was some kind of Branta species. We could not rule out the Brant goose, which looks very similar to a Canada goose. Remember, some of our I.D. 's are limited. We have to be very literal with the limits of how far we can go [with our identifications], but we had already confirmed that yes, Canada goose was in this batch of samples. ... On a normal non-damaging [strike] case, we make one slide to look at under the microscope. For the Hudson River case, we did 78 slides. That's huge for us. Out of those 78 slides, 54 of them confirmed a Branta species. We had to hold it there. We couldn't go to Canada goose, but ... by our standards pretty confident that it was Canada goose. Again, if you think of a normal non-damaging case, a lot of the times we don't do DNA, or we do one extraction, and push it through the DNA lab one time. With this case, we did 91 extractions, and 26 of those did confirm Canada goose. Remember, each sample is labeled with the location on the aircraft wherever it was taken. So, we are already starting to confirm geese in both engines. Now, we've already done step one. We've confirmed that it was the Canada goose. Step two was to recreate the specifics of what exactly happened. So, then we are starting to confirm that, yes, there is Canada goose material in both engines, as well as on the wing also. To try to go more specific, Faridah [Dahlan] did some DNA sexing. For that, it's either going to be female material there or male. In one engine, we did confirm at least one male and at least one female. They call that the minimum number of individuals. We could confirm at least two birds went into one engine. The second engine we could confirm it was male. We don't know if there was more than one male but we know at least one went into the other engine. Laurel Neme: So we're up to at least three birds? Marcy Heacker: At least three. And we know that there were other impact points, non-catastrophic, [on] the wing and I believe one hit the tail also. But the engine obviously was the focus for the NTSB. The engine manufacturers have a lot of experience with bird strikes too. They can actually look at the fan blades and have clues there for the central impact on the fan blades. [NTSB] took our information with their information and combined that. It really was just an amazing case and I am just very thankful that these guys landed this plane because, literally, those birds went straight down their engines. Laurel Neme: Has the engine design changed as a result of this case or is that still being worked on? Marcy Heacker: It's still being worked on. Engines go through certifications for things like hail damage, lightning, wind shear, and they have to be able to withstand these forces. But a lot people don't know that they are certified to take birds. Currently, a majority of aircraft are certified for four pound birds and still maintain the structure. The other thing for civil aviation is that those aircraft can fly with one engine. The average weight for a Canada goose can be around 8 pounds. [US Airways Flight 1549 was] certified for four [pounds], and it took two eight-pound birds in one engine and at least one in the other. It was just catastrophic for the engine. That's a lot of the discussion that came out in the NTSB report. The NTSB has filed their final recommendation and that can be found on their NTSB website. It's pretty interesting. There're going to be repercussions from the Hudson River for a while. Laurel Neme: Based on those findings, things might change in terms of engine design, or how one manages at the airport? Marcy Heacker: It could. There are established standards for wildlife control on and around airfields. But once you get off the airfield property, [it's difficult]. [Birds] are living organisms and they fly and they move and they change and they learn. It's amazing that they were in the wrong place at the wrong time. It's a really interesting case. But everything went okay.